I’m headed to Denver today. I’ve got a venti coffee in hand, also know as Happiness in a cup, and I have some extra time to just hang out. In today’s world, most people complain about airports – they’re big, confusing, crowded and unless you’re fortunate enough to be in the newly renovated terminal, they’re kinda gross. But I LOVE airports. A lady wearing a black fur vest carrying a metal suitcase. Isn’t that heavy? A punk rocker. Not in the real sense, but if what you wear matches your profession, then this kid is definitely a punk rocker. Today I’m wearing furry boots. I think that means I’m either a hunter/gatherer from the Paleolithic era or I like to keep my ankles warm. I’ve seen the same people walk past this spot several times. I thought I was the only one that got to my terminal only to realize that I really should have gotten a snack before I sat down. Hoards of businessmen/women. Who says the economy is bad? People everywhere are flying around the country to conduct business. Someone is making money, right? A guy wearing a mexican sombrero. I’m guessing he’s headed to Mexico? Normally I would be jealous but I’m headed to Denver – same difference. I’m pretty sure this kid was around 12 years old – he had the most incredible dreads. Bob Marley dreads. Have you even been alive long enough to grow these dreads? Ok secretly I was jealous. I want dreads. Except I can’t handle not washing my hair. That would be a major problem for me. Major. A cultural/religious family. I’m not sure what culture or what religion, but it involved old timey prairie dresses, bonnets, and vintage yellow leather suitcases. I could be wrong though, I here vintage religious look is the new black. Some man is flying out today and is totally stressed out about his son. How do I know this? He was sitting next to me and talking rather loudly. Of course I shouldn’t talk I haven’t really mastered the art of speaking softly and being understood. Most likely people all around the world know my business too. I passed a large group of people all dressed alike. They were cheering. It sounded like fun. I passed a smaller group all wearing yellow tees that said something about Vegas. They weren’t cheering (yet) but they were singing happy birthday to someone over the phone. And let’s not forget the celebrity look-a-likes. I once flew home from Bogota, Colombia with someone that looked an awful lot like Hulk Hogan. Today I think Bob Saget’s look alike was checking in to first class. Or it was just some businessman. 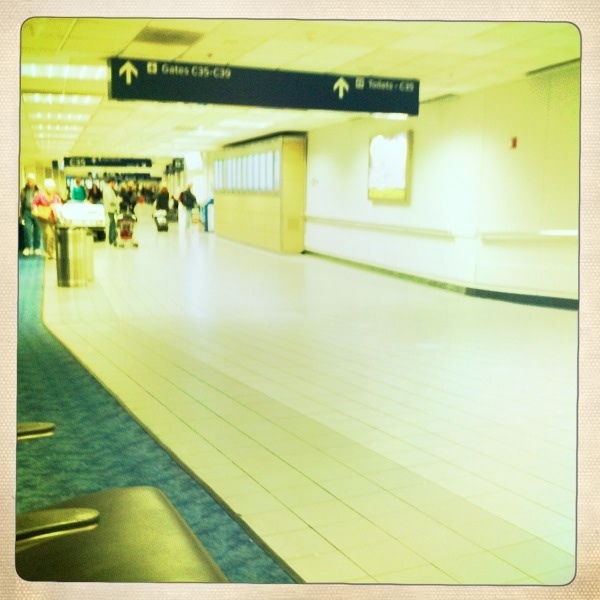 I love airports. I wish I could spend more time in them. Not all my time, just more time. This entry was posted in Just because and tagged airports, bob Saget, Hulk hogan. Bookmark the permalink.